I was careful in the interview, still picked the wrong person. I think I was careful in the interview process, selecting the right candidate. I was wrong. Wasted several weeks interviewing and several weeks finding out I hired the wrong person. Now, I have to start over at square one. Promoted top performer to manager. Now failing. She was with the company for 12 years, top performer, everyone liked her. We promoted her to a game-breaker position and, now, she is failing, like a deer in the headlights. She is demoralized, embarrassed and wants to leave the company. Senior Project Manager blows the deadline, again. He had a good plan in the meeting, schedule looked solid, but it’s Friday and I have to call the customer to explain that the project will be late. There is no reason for the delay, just an excuse. At that pay level, shouldn’t have to hold their hand. I know the problem is tricky to solve, but if I have to answer one more question, I might as well do it myself. If I told them once, told them a thousand times. The work instructions were clear. We reviewed them in the meeting. Everyone said they understood. There were no questions. We had more defects this week than last. Sent him to manager training, same person came back. Our high hopes for this young manager are dashed. Showed such promise. Or did he? What this program covers – this is not re-packaged Leadership 101. Unless you have seen Tom, you have never seen this before. Most who want to take their company to the next level don’t know what the next level is, nor the team required to get them there. Find out the difference between infancy, go-go, adolescence, prime and stable. Unlock and understand the secret behind the Peter Principle, promoting someone to their level of incompetence, and how to test before the mistake is made. Most companies underestimate what is really required for success in a role. Learn the Four Absolutes that must be in your hiring process. Every CEO, executive and manager struggles with the hidden key to performance, revealed in this fascinating program. Tom travels North America working with CEOs on what happens when companies get bigger, from a dozen employees to a hundred, five hundred, to a thousand plus. Since 2004, he has delivered this workshop to more than 450 groups, more than 6,000 executives. In Broward County, Florida, Tom runs multiple executive peer groups, where, since 1995, he has delivered more than 14,000 hours as an executive coach to CEOs. His client base is diverse, from retail to distribution, manufacturing, construction, education, software, professional and industrial services. 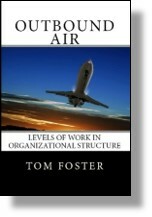 Tom is an expert on business models, organizational structure and hiring. This entry was posted in Time Span and tagged elliott jaques, time span, tom foster on September 6, 2016 by Tom Foster. We have plenty of time to fight fires but never any time to make a plan of attack and everyone pull their weight. We are a bunch of individuals doing our own “thing” without the total picture perspective. We are the “managers” in the business. But we don’t manage; we fight the next fire, sometimes of our own creation. When other managers are not concerned with how their tactics affect the next process in line, the culture will not change. It’s a culture of, now that my part is done, I wash my hands of the problem and pass it along to the next manager to deal with. No ownership of the problem, so, no solution that benefits everyone. How can the culture change when the people with the culture don’t want to change? One of the most important contributions for every manager is to create context. No behavior is isolated. ALL behavior exists inside of a context. Context is a mental state. Wilfred Bion calls this the Basic Assumption Mental State (shortened to BAMS by Pat Murray). If, as a manager, you don’t understand the behavior, all you have to do is get in touch with the Basic Assumption Mental State or the context held in the mind of the team member. What do they believe, in that moment, about the context surrounding their behavior? Let me muse about the context of your team members. The most important thing around here is not to get blamed for anything. The most important thing around here is to make sure, if you make a mistake, it does not get connected back to you, that someone else can be blamed. The most important thing around here is that if you make a mistake, make sure it cannot be discovered in your work area, or your part of the process. If this is what the team member believes (BAMS), what context has been created by the manager that supports those beliefs? Step one, for the manager, is to determine the constructive context to gain the appropriate behavior. Then make that context visible, by example, by discussion, by observation, by consequence. If you are a manager, what is the context to gain constructive contribution from your team? Goal – this is where vision statement, mission statements come in. Most are pabulum that do NOT contribute to context that drives behavior. But try this one from Southwest Airlines – Wheels up. That’s it. That’s the context. Everything a team member does should support getting an aircraft quickly (and safely) into the air. Southwest found they make more money when their planes are in the air than they do when their planes on the ground. Accountability – we normally place accountability one level-of-work too low on the team. In describing level-of-work, Elliott Jaques clearly identified the manager as the person accountable for the output of the team. This one Basic Assumption Mental State, that the manager is accountable for output, is a game-changer. Example – every manager is in a fishbowl and every team member is watching. “Do as I say, not as I do,” creates disaster. Lead by example is not simply a nice leadership principle. Humans are wired to mirror behavior they see. Blaming and punitive behavior by the manager creates acceptable mirroring behavior on the part of the team. Discussion – the manager can talk about context with the team, or the team can talk about context at the water cooler. The manager gets to pick. Observation – the manager is in a position to observe behavior and bring attention to those behaviors that are constructive and point out behaviors that are counterproductive. The manager is in a unique position to breathe life into behavior, for better, or worse. You get the behavior you focus on. Consequences – what happens in the face of underperformance? Is it punishment and blame, or is it learning and improvement? Context drives behavior. Managers create context or allow team members to make up their own. Change the context, behavior follows. This entry was posted in Accountability, Culture and tagged context, elliott jaques, Gustavo Grodnitsky, manager, Pat Murray, Wilfred Bion on February 19, 2016 by Tom Foster. Just wanted to tell you about a massive content update to Time Span 101. Time Span 101 now contains video from our most popular workshop Management Myths and Time Span. We recently produced this recording, and embedded more than 2-1/2 hours in 23 video segments into the learning platform at Time Span 101. If you attended one of my live workshops over the past ten years, this is your chance to re-capture the things you discovered about your organization. Subscribers will receive our pdf workbook, based on the workshop handout, to help organize your notes as you go through the program. If you already have a subscription to Time Span 101, your login still works. You will receive a separate email with more details, including the pdf workbook. Get your login, now, for only $100. Register here – Time Span 101. Follow the program – Timespan101.com is built in a logical sequence, so that one principle builds on another. It’s a no-brainer. Random Access – You might have a particular interest. You can access any of the topics out-of-order based on your own interests. Just Watch the Videos – If you just want to watch the videos, there is a link in [How to Use This Program] to just watch the videos. There are (23) video segments in the playlist. More than 2-1/2 hours of embedded videos. If you know someone else, who might also be interested in the Time Span research of Elliott Jaques, let me know. If you have any questions, just Ask Tom. This entry was posted in Organization Structure and tagged elliott jaques, organizational structure, requisite organization, time span 101 on August 4, 2014 by Tom Foster.